I think I have always had depression. But maybe not. It is hard to tell. I was one of those kids who never mingles a lot. I would always have my nose in a book. I never liked playing with other children because I thought all the games were, well, childish. But I definitely knew I had depression when I was about 16. I knew I had depression, and the rest of the world then knew me as a troubled young girl. No, this post is not about how I was misunderstood. It is about how mental illness is misunderstood. So, as I was saying, I have had depression at least since I was 16. I was taken for a troublemaker then, a recluse in my early 20s and sad now, at 29. And during all this time, I have not managed to convince one person, who does not have depression, that the word does not mean any of these things. It means I have a mental condition. And no, that does not mean I am ‘mental’. Even now, when I am feeling particularly low, I have the added burden of trying to appear normal, happy, carefree for the sake of my parents. Because, as much as I have discussed the matter with them, they always take it as an affront to their parenting. Am I sad because they were not good to me? Is this their fault? No, it is not sadness! Or at work, when you feel low, all you want is to be left alone to do your work. The only way it ‘affects’ my work is that I would not want to talk to anyone. Then why do we have to hide this from employers? No, it is not disabling. And God forbid you tell a partner. Clinical depression, as I have learnt through my struggle with and acceptance of, lasts your whole life time. There will come a period when it is particularly bad and that is when you need a lot of support, and therapy. It may be a decade, as was in my case, a couple of years or less. Even then, if you are determined, it does not set you back in life as such. Your experience of it is affected, but it does not hold you back. For the rest of your life, depression always stays, it hovers over you, and sometimes, maybe once a month, maybe more often, it settles, until you drive it away. I am not trivialising depression, I am trying to balance two arguments here. The first, that when a loved one tells you they are depressed, they do not mean they are unhappy, that your relationship with them, of whatever nature it may be, is not lacking. They are telling you they have a mental illness. Do not be offended, just as you won’t be if they told you they had a physical illness. With just a little understanding, this will not be affecting your life. Do not make it a taboo. Second, I am trying to explain what depression feels like. To me, sometimes it feels like looking at the world from behind a dark veil. You see all the colours, you cherish them, you seek them out. But they are faded. At other times, it feels like a dark cloud. Always hovering over you. You can see the sunny parts in the distance, you can even feel the warmth of the sun, but it does not shine directly on you. So, for instance, you are at a wedding. Everyone is having a good time, they are laughing, looking forward to dancing and eating and dressing up. And you, too, are laughing and dancing and eating and dressing up. But you are not looking forward to it. You do not enjoy it and you do not understand the concept of enjoying it. At random moments during the wedding, even when you have a smile on your face or even at times when you are mid-laugh, you do not understand what there is to laugh or smile about. It is all robotic, imitated. What you may enjoy, maybe, is if you have someone who loves you, who enjoys seeing you have fun. And you pretend to have a good time because you love them and seeing you happy makes them happy. So, you pretend, and that is what you ‘enjoy’. During the time when it was particularly intense for me, I think it was between 2005 and 2015, depression felt like that cloud, the dark one that always hovers, had fallen on me and trapped me under. I remember an episode of Daffy Duck from when I was a child, where he was trapped under this dark tarp. Black tarp. And he could lift it just over his head, but not completely because it stretched on for miles and he did not know how far he had to travel to get out from under the tarp. That is what it felt like. Like I was under Daffy’s black tarp. If I lifted it over my head, I could see my assignments and homework and appointments, but not further. So, I dealt with what I could see in the immediate future and let the rest come. That veil, from behind which you see all those colours on a normal day, had become a dark mesh. So that I was not able to see, or maybe understand, beauty of any kind. They key was to struggle, to keep lifting that tarp and dealing with whatever you see under it and going on. They key was that those who loved me let me be, waited for me to get out from under the tarp. They key is to find someone to talk to, preferably a therapist. I knew I was out from under the tarp, when for the first time in ten years, I found something to be beautiful. It was a simple thing: rain. I had really bad insomnia for the decade that I was under the tarp. I still do, but it is mild now. Anyways, I would not sleep the whole night and continue on during the day, only surviving on naps. I was taking a 5am stroll down the pier near my apartment in Gillingham when I was caught in rain. Big drops at first. Very far apart. I was looking out at the water. I noticed the rain falling in the water. It was as if I could hear each and every ‘plop’ when the drop hit the water. Like I could hear the chaotic ripples as they would hurriedly spread out to make room for yet another ripple as another drop fell and then another, all the while balancing against the tide. Moving up and down as the tiny waves made their way to the bank. I was hypnotised by the scene. So much that I did not notice that I was being drenched by the now pouring rain. As the rain drops hastened to fall into the river, I was mesmerised by the strange dance that was happening in front of me. And as these words left my lips, I realised, in ten years, for the first time, I had found something beautiful. It was like, suddenly, a film had been lifted from my vision. Like I had been seeing through a thick mesh before. I had been missing this feeling. This finding things beautiful. I knew I was missing it. I remembered looking at things and finding them beautiful. For a decade, I had been devoid of any kind of emotion, of anything. I had been unable to even appreciate the beauty in nature. And now I found something beautiful. It was like I had been blind and could see again. It was like, for a little while at least, there wasn’t all gloom around me. There was more to the world than the incredible darkness I had been carrying around for so long. Like it would be ok to hope that one day, that darkness might lift. That moment, that realisation was so strong that I started crying and laughing at the same time. Tears as big as the rain drops fell down my face. And for the first time in a long time, they were tears of joy. I was almost afraid of getting my eyes off of the scene. What if I look away and then this feeling never returns? What if I never find anything beautiful ever again? The rain intensified to hail and I had to run back to my apartment. I looked back at the river reluctantly. I wanted to save this scene in my mind forever. Maybe this will be the break in the long depression. I laughed as I made a run for the door. The elevator doors opened and I saw a reflection of myself in the mirror. I saw something else I hadn’t seen in a long while. A smile in my eyes. 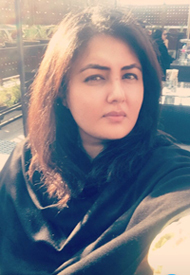 About Author: Sanam Zeb is a sub-editor at the Daily Dawn in Islamabad. She has a degree in journalism from the top school of journalism, the University of Kent and has vast experience in TV, Radio, Online and Print journalism.